If political turbulence has you feeling sick, the patch you might need is Naomi Klein’s new book, “No Is Not Enough: Resisting Trump’s Shock Politics and Winning the World We Need” (Haymarket Books, 2017). It describes how this virulent presidency “is a symptom of a deep sickness” within our culture and how our nation might regain not just equilibrium, but healing. As a result, his administration is operating as a kleptocracy – shamelessly promoting the Trump family brands, ignoring the emoluments clause of the Constitution and shutting out public scrutiny (closing access to White House visitor logs, for example, and banning recording at what are now only nominal “press briefings”). Each new ethical breach does more than enrich the Trump family coffers; it erodes trust in government, weakens our democracy and feeds corrosive cynicism. Trump views himself, Klein writes, as “the executive producer of a country, always with an eye on the ratings…. [and ready to] edit reality to fit his narrative.” The starkest example of his rebranding of reality – and the highest-stakes one – is Trump’s refusal to acknowledge the scientific consensus on climate change. Even as climate disruptions proliferate and intensify, far faster than scientific models had predicted, Trump is easing the way for maximal fossil fuel extraction and minimal checks on carbon emissions. Klein speculates that Trump reversed his position on climate change when he realized that reducing emissions would necessarily curtail unfettered corporate activity and require investments in the public sphere. Committed foremost to maximizing his own net worth, Trump cast his lot with climate-change deniers more concerned about short-term profit than either scientific facts or planetary exigencies. “Trump’s collusion with the fossil fuel sector is the conspiracy hiding in plain sight,” Klein asserts. During just six months in office, he has pulled out of the Paris climate accord and begun efforts to foster more oil and gas drilling, end the Clean Power Plan, roll back a moratorium covering new coal leases on federal lands, cut funding for public transit, gut vehicle fuel-efficiency standards, terminate the environmental review of the Dakota Access pipeline and reverse an earlier rejection of the Keystone XL pipeline. Klein offers a sobering warning that the Trump administration could meet two of its key goals – generating media distractions and aiding the fossil fuel industry (by driving up oil prices) – by orchestrating or escalating a war. It need not even be planned, she notes, given a temperamentally unstable leader “drunk on the allure of showing the world he’s top dog.” Shock politics has entered a new and dangerous era. Yet Klein remains optimistic, acknowledging that shocks can also waken people, mobilizing rather than subduing them. The last six months of governmental tumult have fostered in many Americans a renewed commitment to civic responsibility and grassroots activism. 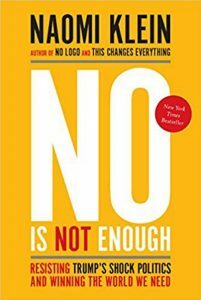 To maintain that momentum, Klein believes, people need “a yes worth seizing”: a clear vision for a world powered not by unrelenting extraction and exploitation, but by an ethic of caretaking. She calls for a shift from being “protesters” (settling for minor reforms) to being “protectors” – of the earth and of each other. It may seem like a stretch to envision any such ideal in the current political climate. But paradoxically, this administration’s unbounded mendacity and rapacity may act as a vaccine, strengthening citizens’ collective commitment to forge a sustainable economic system and a compassionate culture.